Autograft is a tissue or organ that is grafted into a new position in or on the body of the individual from whom it was removed; whereas allograft is the transplantation of tissue taken from one individual to another. 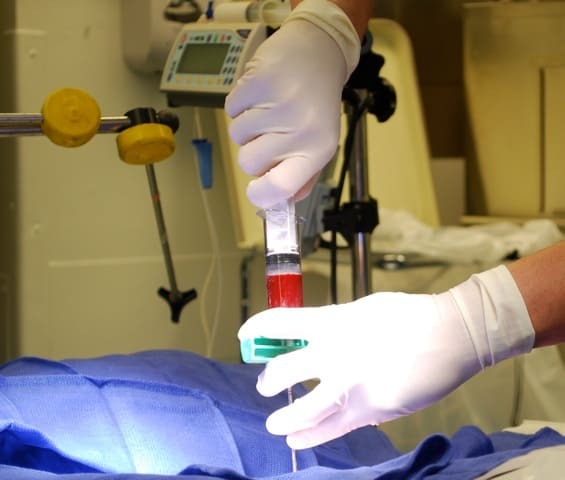 Bone Marrow Aspirate Concentrate is an autograft while Amniotic Fluid Concentrate is an allograft. Autograft, at this time serves as the gold standard for almost all situations in which the use of orthobiologics is indicated. Bone Marrow Aspirate Concentrate (BMAC) offers nearly every essential component involved in reversing the damage caused by arthritis including Adult Mesenchymal Stem Cells, Growth Factors, Cytokines, and Vascular Progenitor Cells. Because of the inherent value of Bone Marrow, my first interventional thought is BMAC; in addition it is virtually free of risks and side effects. The U.S. Food and Drug Administration (FDA) has approved certain growth factors and allied substances for specific indications. Platelet Rich Plasma falls into this category. In addition to BMAC, Autogenous PRP contains many growth factors as well. Stem Cells are at this time, the ideal biological treatment because they recreate the original microenvironment and supply paracrine factors (a type of hormone which binds to receptors in nearby cells influencing their function). Bone Marrow Aspirate contains a variety of cell types such as endothelial progenitor cells (EPCs), osteoprogenitor cells (OPCs), stem cell niche-supporting cells, and cytokines. You bet this is confusing and not easy to understand. That’s why I try to clarify by writing the Blog. At the same time, it demands that a clinician stays well informed and not depend on the hype of marketing from the start-ups in the field of orthobiologics to influence a potential patient intervention. On Thursday, I travel to Broomfield, Colorado for the first meeting of the Interventional Orthopedics Foundation, the first not for profit dedicated to Regenerative Interventional Orthopedics: The Next Frontier. My presentation will be based on the 24 month outcomes of Bone Marrow Concentrate in knee arthritis. Another issue will be addressed, are there viable stem cells in Amniotic Fluid Concentrate? The Regenexx Advisory Board of which I am a member, will review the challenges presented by the patient with Grade 4 Osteoarthritis for whom until now, we have had little to offer other than referral for a joint replacement. Next week, I will be in a position to upgrade the reader about the present role, if any for mechanically liberated, adipose derived, stem cells as this subject as well will be studied by the advisory panel.